Any decision having to do with the safety of your child is tough. If you’re like me, then trying to find a high quality car seat was hard enough – but when your child outgrows their car seat, like mine did, you’ll need to start the process over again until you find a high quality booster seat. When I started looking for a car seat that would suit my three year old, I knew that I wanted something that could grow with him. I knew that there had to be some kind of child safety seat that could change into a booster seat when my child grew. 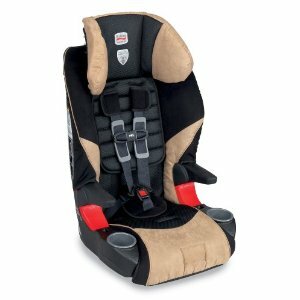 So, I started looking online and tried to find the perfect safety seat/booster seat combination. I found all kinds of seats that claimed to “grow with your child” but found almost all of them to be inadequate. 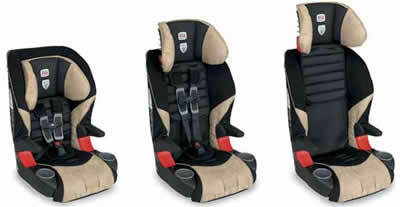 However, there was one product called the Britax Frontier 85 Combination Booster Car Seat that really stuck out to me. It has a special design that allows my child to use it as a harness seat until they weigh 85 pounds. After that, he can start using it as a booster seat until he weighs up to 120 pounds. Plus, the safety features blew me away. What should you look for in a quality car seat? While I was looking for the best product, I came across to several characteristics that I knew I wanted. The Britax Frontier 85 was really the only seat that combined all of these into one. How did the Britax Frontier 85 Car Seat stack up? Believe me, after I did a little bit of research I was quite impressed with the Britax. Of course, the most important thing about a car seat is that it keeps my kid safe. I don’t know about you, but I’m not the kind of parent that will just walk into a department store and buy the cheapest car seat available. I need to know that the manufacturer has done their research and created something that will keep my kid unscathed in the event of an accident. So, naturally I paid a lot of attention to the safety features of the Britax. I was pleased with what I found – they are one of the top safety seat manufacturers around. They are very well respected and considered the “top of the line” to thousands of parents! First off, when the seat is being used as a child safety seat (instead of a booster), it uses a 5 point harness. This is the type of harness that is most often recommended by child safety experts around the world. It will keep your child snug and tight in the seat, while still allowing them to be comfortable. It is called a 5 point harness because it is connected to the seat in five places. This seat also allows them to use this safety harness until they weigh 85 pounds! That means you can keep them extra safe for a longer period of time. The seat also offers very deep sidewalls, especially around the head. This will help keep your child’s body safe and sound in both front and side accidents. The entire thing is lined with safety foam that will work to absorb impact. Plus, the base of the seat is designed to absorb force as well. This seat has really been engineered to protect your child in any dangerous situation. Even though there are tons of seats on the market that claim they are able to grow with your child, the Britax Frontier 85 can actually back up that promise. 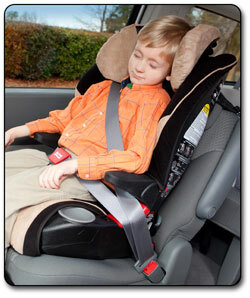 When your child weighs anywhere from 25 to 85 pounds, the seat can be used as a forward facing harness seat. But, we all know that children grow fast. As they get taller and taller, the adjustable headrest will actually expand to make the back of the seat tall enough to fit your child comfortably. Also, this adjustable feature helps to keep your child’s head safe. When they get to be above 85 pounds, the seat becomes a booster seat. This puts your child in the correct position to use your car’s seat belts. The transition from harness seat to booster seat is easy. All you need to do is remove the 5 point harness and pull your vehicle’s lap belt and shoulder belt over your child to keep them snug and safe. This seat can work as a booster until your child weighs as much as 120 pounds. Because of this, it is truly the last safety seat that you’ll ever need to buy. It will keep them comfortable for a longer amount of time while never letting down on safety. Even as a booster seat, your child will be covered by safety foam and secured by your vehicle’s shoulder harness and lap belt. There is no doubt that most car seats are like a puzzle to install. Britax fixes this with their convenient LATCH system. All you need to do is attach the specially designed latches to the seat of your car and installation is complete. You could buy another seat and spend hours trying to get it installed properly, but why? The Britax will quickly install in almost any vehicle. It has a slim design that makes it perfect for use in trucks or SUV’s as well. Once the seat has been installed properly, it is extremely easy to adjust both the headrest and the harness so your child is comfortable. On most seats with an adjustable headrest, you must completely disassemble the harness before you can change anything having to do with the headrest. With the Britax, you can leave the harness attached and make any adjustments to the headrest to make sure that your child fits into the seat perfectly. It is extremely quick and easy to adjust. With a product as important as a car seat, it is basically impossible to go without a few complaints from parents. I was able to find a few people that said the LATCH system was not compatible with their car. With some older model cars, this can sometimes be a problem. However, the seat is designed so it you can still install it using your vehicle’s built in safety belt – a fix that has worked for many parents and still provides a safe ride. Yes, the Britax Frontier 85 comes with a one year warranty. It gives you a bit of peace of mind so you can make sure the product works! While I was researching the Britax, I looked at tons of different places that sell it. However, I found the best prices online. In fact, Amazon.com consistently offers a much lower price than just about any department store. You might also qualify for free shipping. I would suggest that you start your shopping search at Amazon. A child safety seat is one of the most important purchases that you can make as a parent. Make sure that you do some research so you can be completely sure that you’re comfortable putting your child in the seat that you choose. Do not make this decision quickly, and make sure that you are buying the right seat for you and your child.